It seems to be the hardest, yet most rewarding post we do each year: the last one to close out our racing season. We are sure, even after five years as a team, that most don’t truly know who we are. We are a proud race team and an even prouder charity that is dedicated to kids first, raising money and racing. This post is focused on racing and a thank you to the greatest team, we think, ever assembled at Berlin Raceway. We have accomplished a lot on the track, none of which would be possible without the efforts of each and every person that has been associated with Racing Awareness, the 97L Modified, the 55L Super Late and the 101L Super Late. Our team gave selflessly and tirelessly, dedicated to success throughout 2014. Our team was there to celebrate with Ben Welch after winning his first ever Berlin Raceway feature. Our team was there supporting both Dave Lake and Joe Bush as they battled in the ultra-competitive Super Late division at Berlin Raceway, perhaps the toughest division of short track racing in the country. Again, to our immediate team and all those that helped out throughout the year: THANK YOU, because without you, there is no TEAM RA. Steve S, Shane D, Keith A, Jerry S, Patrick M, Bob M, Steve H, Mike W, Larry O, Don J, Mark D, Ray D, Nick S, Lauren B, Jason S, Dirk R, Denny P, Josh B, Scott D, Caleb B, Trina L, Meg W, Lorraine B, Mistie B, Kevin S, Jodi W, Cindy M, BJ B, Tami G, Tom G, and Liz J. We would also like to thank our partners. Virtually every name on the sides of our race cars have been there since day one. Our partners are loyal, giving and most important of all, supportive of what we do and why. THANK YOU! 2014 Racing Awareness Partners – Performance Systematix, Baker Engineering, Request Foods, Keith Alexis – State Farm, Gordon Food Service, Festida Foods, Engine Pro, Vanderhyde Ford, Top Of The World Granite, Travis Truck & Auto Collision, Korte & Kowatch, Kendall Oil, The Screen Print Department, Van Manen Petroleum, Berger Chevrolet, Horvath Design and Enterprise Iron & Metal. Many think that Helen DeVos Children’s Hospital is sponsor … that has never been the case. HDVCH is simple the reason we race. Saturday September 6. 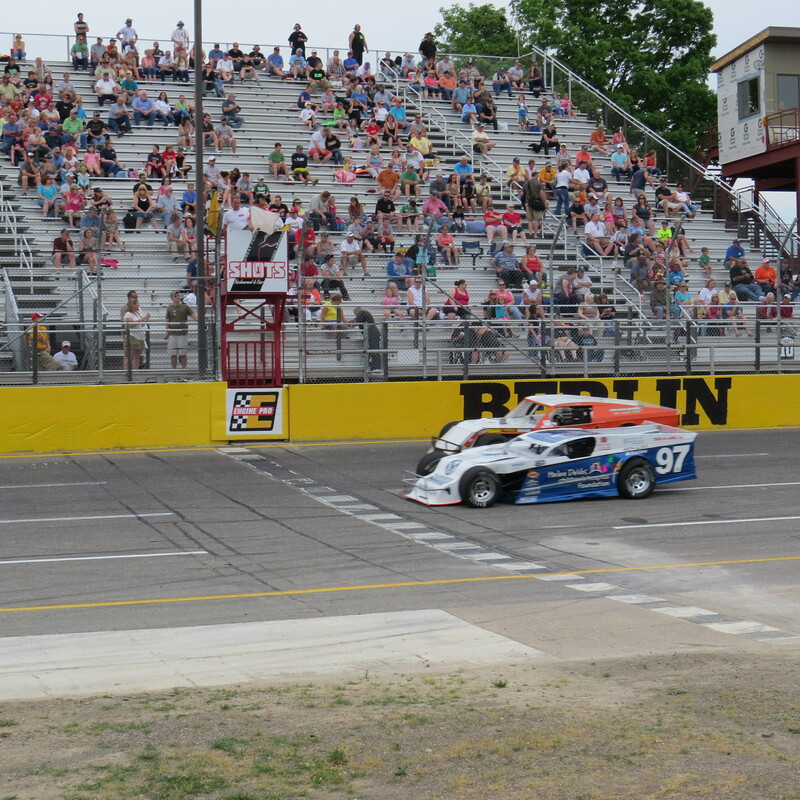 Make plans today to see the last races for the 2014 season at Berlin Raceway! final checkered flag of the season. Unfortunately for the race teams and the fans of Berlin Raceway, Saturday night will mark the close of the pavement season for 2014. RacingAwareness.com, along with all the Berlin race teams, invite you to join us for the final pavement show of the year, The Chet Championship Night. All classes will be in action: Super Late Models, Outlaw Late Models, Modifieds, Super Stocks, Sportsman, Vintage Modifieds, and 4-Cylinders! Champions will be crowned. And, together we can all reflect back on a great year of auto racing here in West Michigan. Berlin Raceway is a short track showplace thanks to the ownership, staff and those before them. Saturday night, the Military/Veterans and those 65 years of age or older are FREE; for all others, general admission tickets are only $12 for adults. The 5th Annual RacingAwareness.com Charity Golf Outing powered by Consumers Credit Union just received a sporty shot in the arm with the announcement of a new Ford Fusion to the event as a hole-in-one prize. “Vanderhyde Ford has been a partner of RacingAwareness.com from the beginning and they just seem to embrace what we do”, said Norm Jelsma, RacingAwareness.com Vice President. They are a small town Ford dealer that believes in West Michigan, the community and giving back. We are thrilled to be partnered with this group of people”. The challenging Thousand Oaks Golf Club will play host to this year’s outing on September 15. The four course par three holes will again each have big dollar prizes associated with them, courtesy of Vanderhyde Ford including a chance to win the car. RacingAwareness.com’s is dedicated to enhancing the lives of children and their families coping with the illness or injury of a child. RacingAwareness.com’s efforts are focused on raising awareness and funds to launch and sustain programs and services provided by Helen DeVos Children’s Hospital Foundation of Grand Rapids Michigan. RacingAwareness.com is a Michigan based 501 c3 nonprofit charity supporting Helen DeVos Children’s Hospital. Learn more about RacingAwareness.com and how you can become involved, visit www.racingawareness.com. Super Heroes and Super Fast will be the theme for this Saturday night at the Berlin Raceway in Marne Michigan. Helen DeVos Children’s Hospital Night at the track will be star studded with your favorite drivers and those that protect our planet. Join Superman & Wonder Woman, Batman and Batgirl, Spiderman and Supergirl, along with Captain America for our celebration of kids! Saturday, June 28, will include an autograph session beginning at 5:45 p.m., followed by racing at 6:30. This Saturday’s 4-in-One show will include the Boyne Machine Super Late Models, Model Coverall Modifieds, Enterprise Iron and Metal Sportsman, and the Kalamazoo Vap 4- Cylinders. Meet and greet your favorite Super Hero on the track during the autograph session. The Heroes will also take to the grandstand once the first green flag flies. But wait, there’s more: Kids inflatables, airbrush tattoos and spin art, plus Tommy from the morning show on STAR 105.7 will also be on hand! Don’t forget to bring your camera! RacingAwareness.com will be celebrating their 5th Anniversary. To date, RA.com has raised more than $150,000 for HDVCH! RA 97L Modified on the restart. After a full day of racing yesterday the RA team finished a good night and starts a short turnaround for the 97L Modified and racing this Wednesday, while the Super Lates take the next three full weeks off in preparation for Helen DeVos Children’s Hospital Night on Saturday June 28. The 97L Modified and driver Ben Welch, had a strong run in the feature and finished second for the second week in a row. Modified top 5 were; Billy Shotko, Welch, Billy Eppink, Ryan Gruppen, and Ryan Hamm. Welch and the 97L will be in action this Wednesday, June 11, when the Top Speed Modified Series rolls into Berlin Raceway. The RA Super Lates had good practice and qualifying sessions with the 101L posting a 2nd place qualifying time and the 55L a 6th place time. Both cars were strong going into the 60 lap feature where they settled into the top 10 throughout the majority of the race. The 101L worked its way to the fourth position before being caught up a lap 32 crash on the front stretch with the 24 of Lee VanDyk, the 99 of Ross Meeuwsen and the 1 of Barry Hartwell. The race was red flagged for the clean up, after which, the RA 55L continued to finish the feature in the 7th spot. SLM top 5; Tom Thomas, Andrew Nylaan, Tim DeVos, Nate Watson, and Brandon Hermiller. 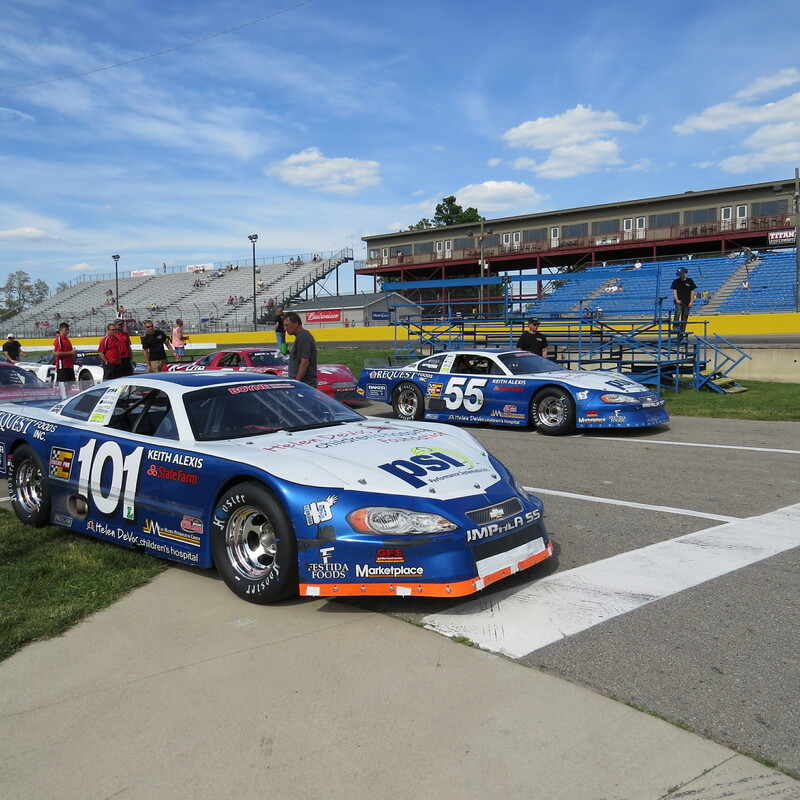 The RA SLM cars will return to the track for HDVCH Night on Saturday June 28. For the June 28 event, each RA SLM will carry a one of a kind autographed hood dedicated to the patients and families of HDVCH. Hoods were autographed at the Michigan International Auto Show in February by hundreds of race fans and will be auctioned off with proceeds going to Helen DeVos Children’s Hospital. RA SLMs 55L, with driver Dave Lake and 101L, piloted by Joe Bush. The full Racing Awareness team will be in action at Berlin Raceway tonight, with racing action beginning at 6:30. Super Late driver Joe Bush is looking to leverage a good run last weekend with the CRA/ARCA series as the SLM are in action tonight. RA SLM driver Dave Lake will put the 55L back on the track tonight also and is looking forward to stretching the 55L’s legs. The 97L Modified team with driver Ben Welch will see action as well and is looking forward to picking up where they left off after a second place finish last week. Special welcome to patients and family from Mary Free Bed Rehabilitation Hospital tonight! Super Hands! Get yours today! Super Hands will be available for sale for $10 per hand from RA volunteers tonight and at the 97L trailer in the pit area after the races. All hands sold will be put on the 97L Modified for HDVCH Night Saturday June 28! Tonight is Kid’s Night featuring FREE admission for kids 11 and under AND the first 500 kids Eat FREE (hot dog & a pop). For all ticket and scheduling information go to www.berlinraceway.com. 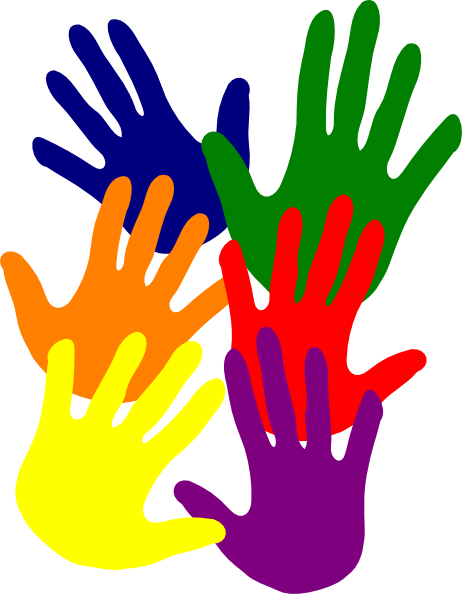 Super Hands are colorful cutouts of a child’s hand, very similar to popular icon fundraisers. 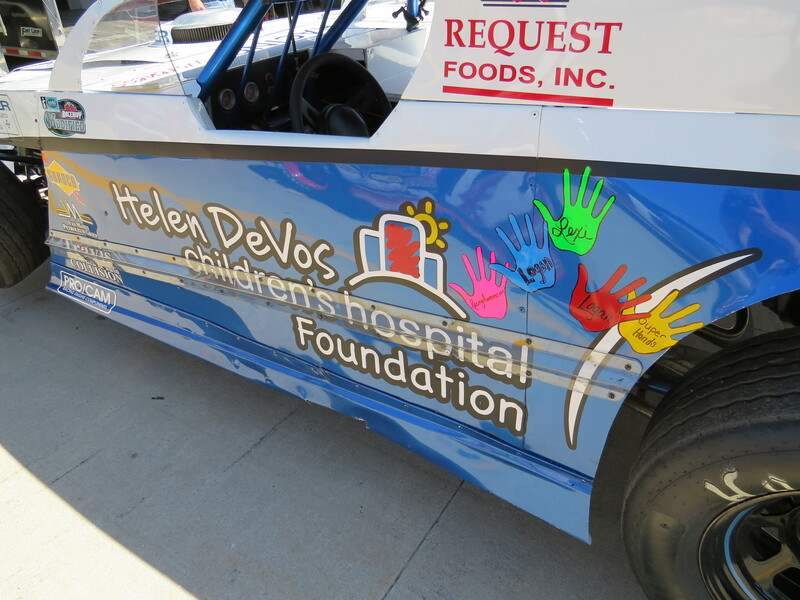 RacingAwareness.com has put a twist on it, Super Hands are decals that will be added to the RacingAwareness.com supporting Helen DeVos Children’s Hospital 97L Modified for HDVCH Night, Saturday June 28. 3. Write a note, autograph, dedication, etc. (optional). Available for purchase at the RA trailer after each racing event. Purchase one Super Hand for yourself, a Super Handful for family, friends, coworkers, employees, or even blank ones. We’ll have blank ones signed by HDVCH patients and add them to this special collection with your support! If you would like to support the Super Hands fundraiser by purchasing Super Hands or possibly selling Super Hands in your business or organization, please contact RacingAwareness.com with your contact information via email at RacingAwareness97@gmail.com to make arrangements. Many ‘Super Hands’ makes fast work for the children and families of Helen DeVos Children’s Hospital. 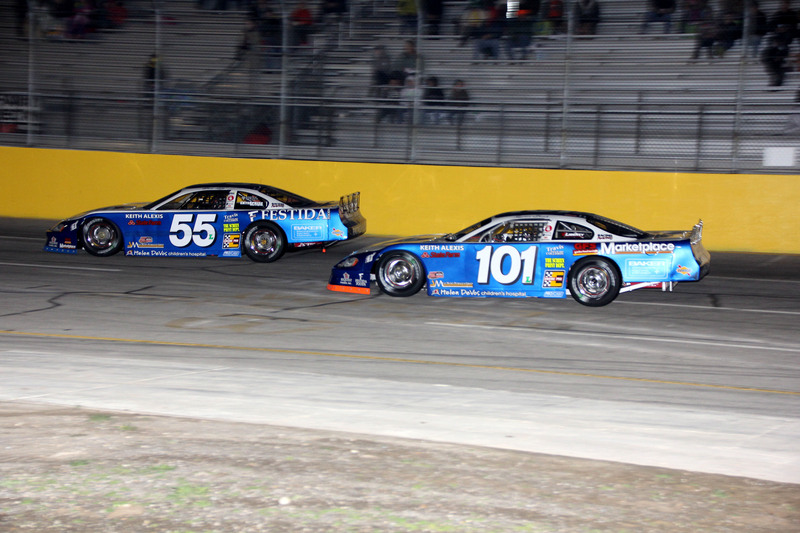 In his first run of 2014 at Berlin, Wyoming’s Brian Campbell, captured the checkered flag in last night’s SLM feature. Campbell, who is running the ARCA/CRA Super Series, returned to run the weekly show where he ran in the middle of the pack for most of the race before turning up the wick and taking advantage of a late race caution. SLM top five were Campbell, Barry Hartwell, Ross Kenseth, Tom Thomas and Ross Meeuwsen. RA drivers Joe Bush, 101L, came home in the 9th place, while Dave Lake in the 55L, ended up 19th after a race ending incident in turn one on lap 46. The RA team will take the Memorial Day weekend off and return to the track with all three cars on May 31 when the CRA Super Series rolls into the Berlin Raceway. RacingAwareness.com driver Ben Welch made a dramatic last lap pass on Ryan Hamm in turn 4 to score RA’s first win of 2014 in the team’s 97L Modified. The victory is Welch’s first feature win at the Berlin Raceway and the 20th victory for the RA Modified since the team’s debut in 2010. The Modified feature Top 5; Welch, Ryan Hamm, Nick Bonstell, Billy Eppink and Billy Shotko. Welch becomes the 8th different RA driver to claim a feature win, joining AJ Allmendinger, Mike Skinner, Mike Bursley, Brian Campbell, Johnny Benson Jr, Kevin DeGood and Dave Lake as feature winners. The RA Modified will be in action this coming Saturday, May 10, at the Berlin Raceway. Saturday’s event also included the debut of first year RA driver and Berlin veteran Joe Bush in the RA 101L Super Late. Bush opened the season strong with a heat win, started the 60 lap SLM feature on the pole and finished 6th. Dave Lake, in the team’s 55L, also had a good day in his SLM and finished 11th in the feature after a late race spin. The Super Late models are in action next on Saturday May 17. 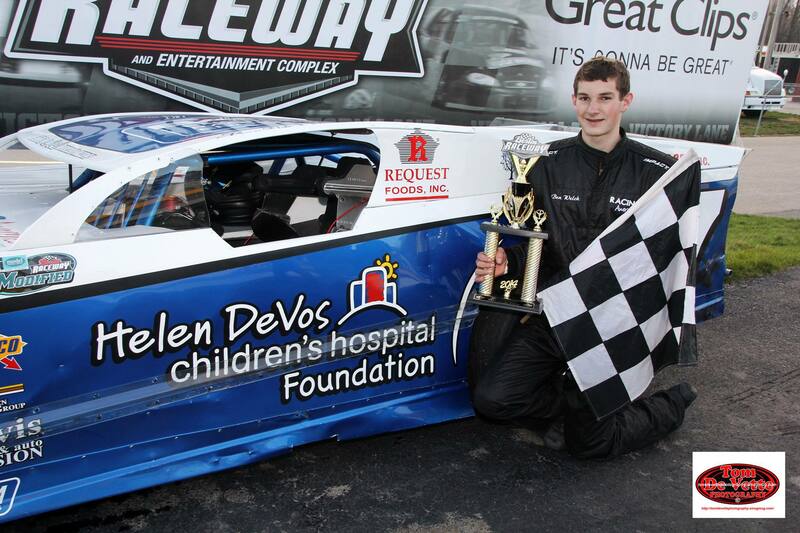 Follow all the latest on Facebook search RacingAwareness.com supporting Helen DeVos Children’s Hospital. Jimmie Johnson is a six time NASCAR Sprint Cup Champion Super Star. He grew up on the west coast racing motocross beginning at age 5, before turning his focus to off road stadium racing. In 1998, Jimmie raced for a local West Michigan owner in the ASA Series before joining Hendrick Motorsports. His time spent in the NASCAR Nationwide Series was virtually transparent, but in 2002 he moved to the NASCAR Sprint Cup Series taking NASCAR by storm. This list of drivers below come from all walks of life and diverse backgrounds. Each of these drivers is hoping to etch their name in NASCAR’s history book as Jimmie Johnson has. The reality of course, is that the chances of that are slim. Who to do you believe will be NASCAR’s next Super Star?